"When I am an old woman, I shall wear purple," proclaims Jenny Joseph in the famous poem, "Warning." To take it literally, I think I'll start early (about a quarter of my wardrobe is purple anyway). 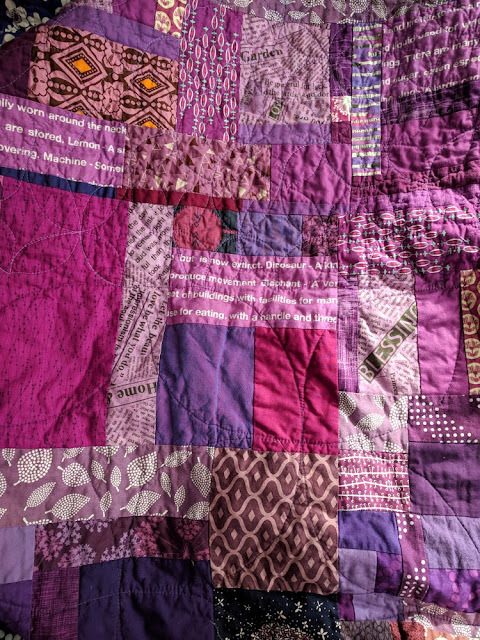 Even further, the world needs more purple quilts - I've already made several but it's not enough! 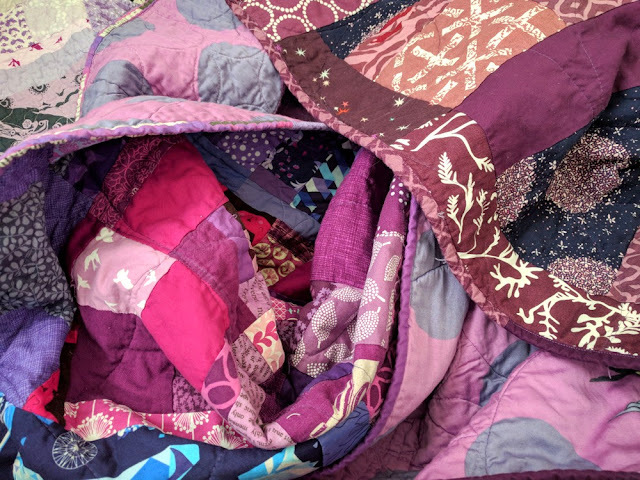 Two years ago, I noticed that my purple scrap bin was piling up awfully high (I have an admittedly nasty/wonderful penchant for collecting good purple fabric), so I started piecing scraps together little by little. Full disclosure: I cut a little bit from some pieces of yardage, to fill out the colors I was looking for (and to feature a couple of much-loved fabrics) but for the most part, these were scraps. The blocks sat around until late last year, and in the restful, non-holiday parts of the end of December, I quilted and bound it (scrappy, value-matching binding for the win)! "Purple Majesty" is named for two reasons: 1) Purple is known as a majestic color - for royalty and for awesomeness (okay, I'm biased). 2) Ultra Violet is the Pantone Color of the Year. So purple wins 2018. I hope that means a lot more bright, saturated, modern purple fabrics will come out in the next couple of years! I'm waiting, fabric companies! After I made a whole bunch of blocks in brick-by-brick improvisation style, I decided to piece them from light to dark (high to low value) in a diagonal cascade. It took a while but it was so worth it! 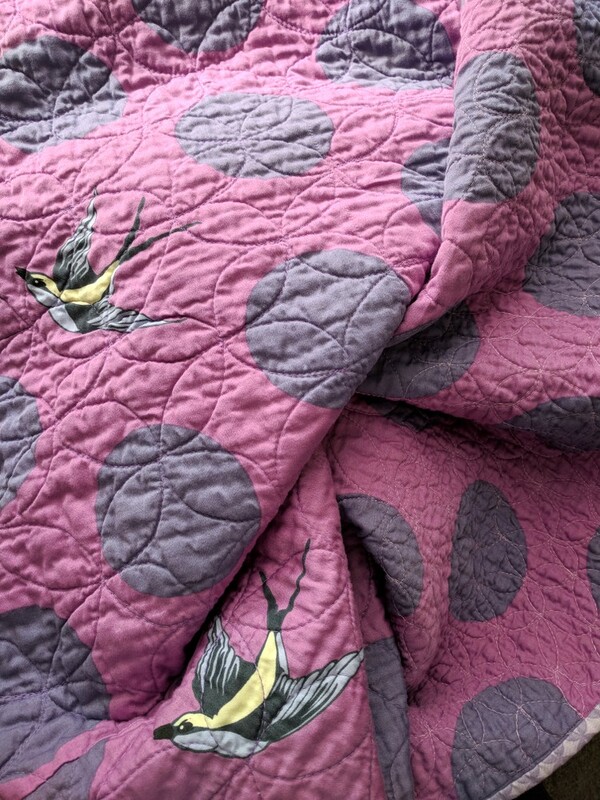 Monochromatic quilts might be my favorite things (I still haven't gotten over how much joy making "Peace" brought me). Many of these are "precious" fabric scraps - some are fussy cut, and there are a couple of orphan blocks in there. It was so good to USE them. If you use a scrap and you keep the quilt, it's like still holding onto the scrap, right? Quilters, I know you understand. 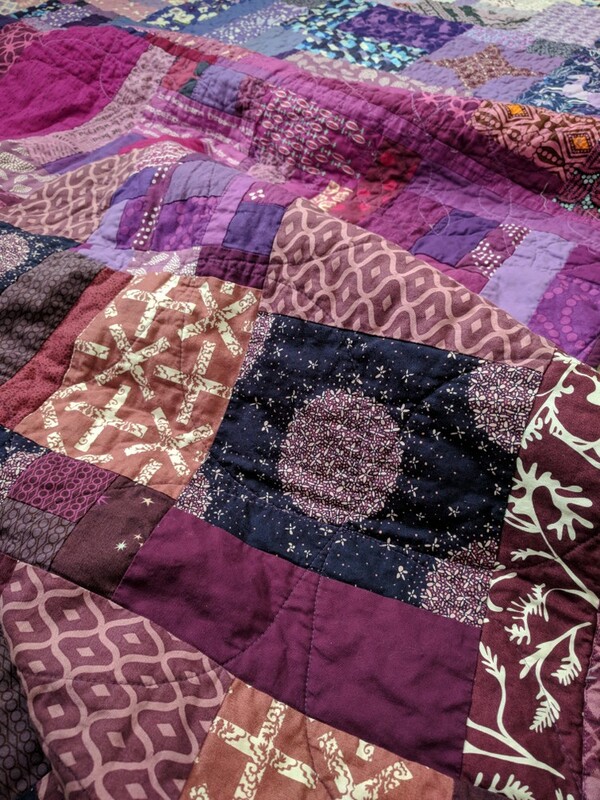 Then, to mimic the cascade, I quilted orange peels by size; small ones in the light purples, medium ones in the middle, and huge ones (marked with chalk and quilted with my walking foot) in the darkest part. I was finishing up listening to The Hate U Give by Angie Thomas at the time, so I'll always associate this quilt with that riveting book. 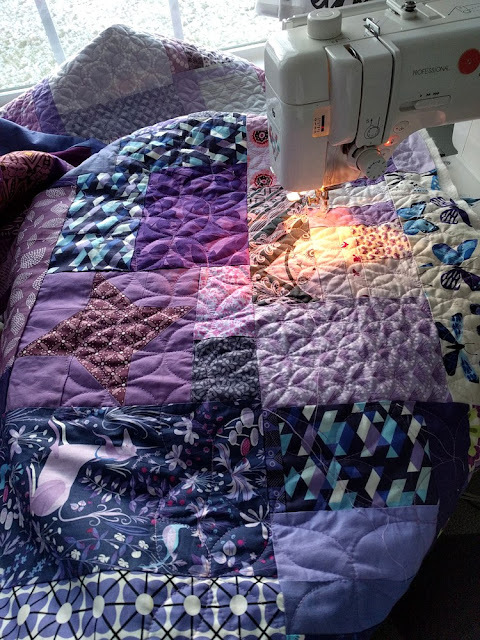 I remember wishing I had more quilting to do so I could keep listening! I used three shades of 50 weight Aurifil thread to bring the orange peels to life (2515 Light Orchid, 2520 Violet, and 4225 Eggplant). They don't show up to well until you get closer, since there is *so* much awesome going on with the many, many prints. But I know they are there, and that's what matters! Orange peels and purple are pretty much my life. I'll admit that the darkest section (bottom right, also pictured below) is *not* a purple I like (gasp! ); it's dark bright and has a bit of a Marsala feel (never jumped onto that bandwagon - just a personal preference). BUT, combined with these other purples, it feels right at home. Now, I love that little section of the quilt! Funny how color placement can make all the difference. The backing is the wonderfully soft sateen Tula Pink wide back fabric, "Free Fall." I gathered a couple of pieces, just waiting for the right project, and BOOM! - it came along. Users beware: there was some talk on Instagram about this fabric bleeding, so I made sure prewash it (and I only prewash if it's really important - I did NOT want to ruin this quilt!). When I washed the full quilt, I threw in a couple color catchers and all was well. No problems, and it washes soooo soft. Just make sure you prewash, okay? Currently, this quilt is in my sewing room/office, and I don't think it will be going too far. It's going to be cold for a couple more months, so I might as well get comfy and wear a purple quilt all the time, right? In case you're wondering... no, my scrap bin didn't go down enough (scrap quilts create more scraps... it's a vicious cycle!). Which means it's time for another quilt! This is such a beautiful and delicious finish. I can tell you enjoyed everything about making this one, and the different sized orange peels are an amazing final touch! Purple is one color I do not have much of or have ever had enough on hand!! This is gorgeous! There is something about a big scrappy quilt that warms my heart! This is really lovely! Love the purple and look forward to sewing with it more this year, cuz you know, COLOR OF THE YEAR!!! 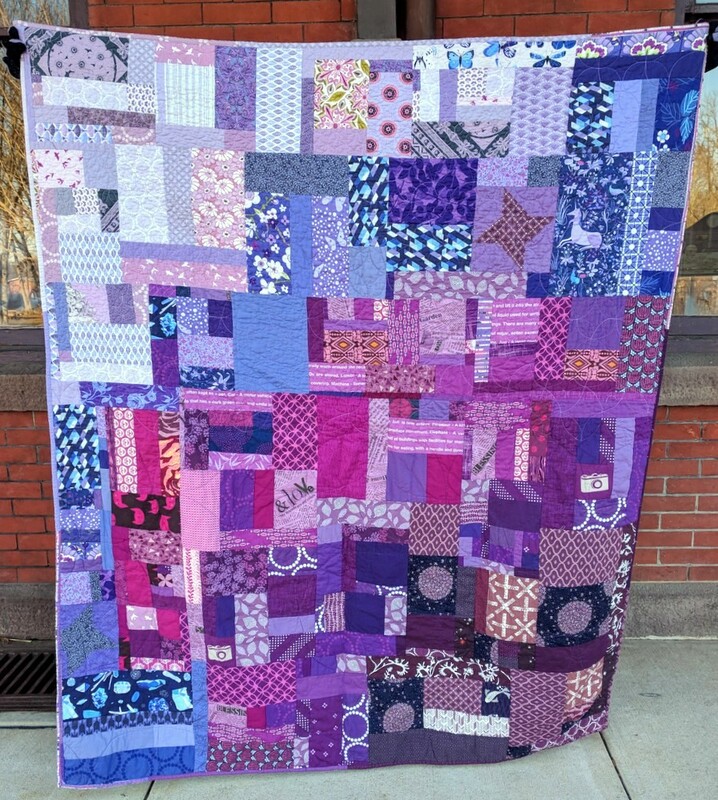 Wonderful scrap quilt!! LOVE the purples in it and the progression of different purples from corner to corner. I really like this quilt! The gradient of purples along with the changing scale of the orange peels was really successful. I love purple, too, and this is stunning! Well done! This quilt is 100% you! 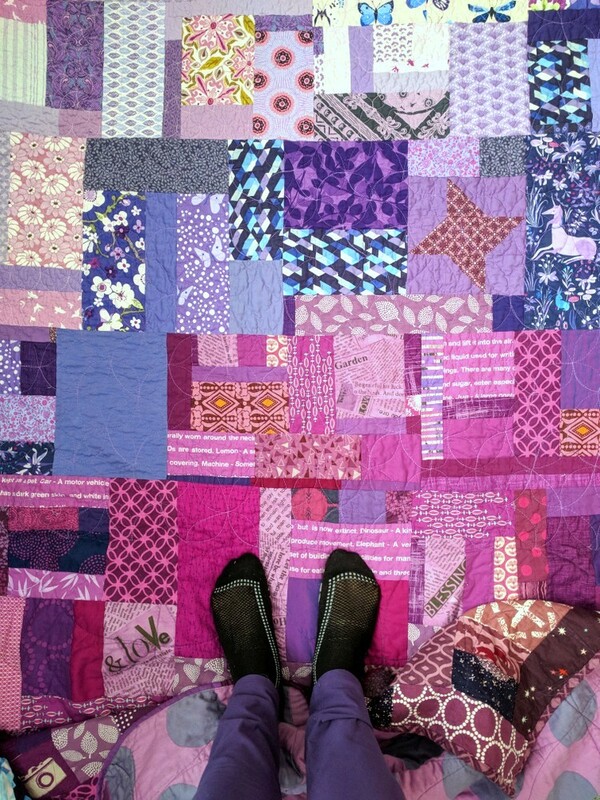 It must be fun to gaze over all those precious bits now that they're in quilt form (so much Lizzy House -- loooove!). And having those scraps turned into a finished quilt means you can hold them and enjoy them while not feeling guilty about them not being used yet :) This quilt practically screams "Jess made me"!